Mouse Mischief integrates with PowerPoint 2010 and 2007, allowing teachers to create multiple-choice, matching and drawing question slides that students, each with their own computer mouse, can answer on a shared screen. The art of teaching, anywhere in the world, has always been challenged by harsh realities like the training that was accorded to the teacher prior to actual teaching, the resources that are made available to them as well as the state of the students that are assigned to them. Did you know that in the National Capital Region (NCR), the standard teacher student ratio is 1:33 on the average but should ideally be 1:25? Outside of the NCR especially in far flung areas, this ratio can go as high as 1:70. This challenge alone heavily affects the effectiveness of the teacher and impacts the learners directly in terms of knowledge acquired. If you are in the public sector, couple this with the limited per classroom budget of the government and the teacher is put in a very difficult situation and delivering on their jobs becomes next to impossible. Technology is the clear solution to neutralize this problem. Barr (1990) emphasizes that “If we wish to prepare students for life-long learning, we must begin to introduce them to the tools which they will use in the careers they pursue after their formal education is completed”. "A successful experience with technology depends on how the technology is integrated into the classroom" (Dodge, D., L Colker, & C. Heroman 2002). The opportunities of the century changed through new technological approaches in every field. One and the most important of these fields are education and instructional systems. Through the technological changes, students of this century need to understand the opportunities and advantages of the new approaches. The effective use of technological opportunities by students and teachers on education is the requirement of new technological world. Technology aided instructional applications in schools have become widespread, from pre-schools through the university level. Instructional technology use in pre-schools helps students learn effectively and increase learning enjoyment through game-based instruction. The technology is a place where children can have fun while exploring the many exciting things through its opportunities. Technology is also a way for children to demonstrate self-direction and independence. If technology can be used effectively in classrooms, children’s learning opportunities will multiply. Clearly, you will all agree with me that Technology is the great equalizer. However, it should be a technology that is cheap and quick to implement so that even the most remote areas can afford them. A specific technology that has been used for some time in teaching is a Clicker. This is a tech wherein students are given a device (clicker) that they can use to react to whatever the teacher is saying or asking. This has been known to increase the teacher-student interaction level. Computer software giant Microsoft has introduced a FREE add-on to its popular Microsoft Office PowerPoint product that allows it to convert a computer mouse into a clicker. It does not have the full functionality of commercial clickers but it already accords the teachers enough interactivity. 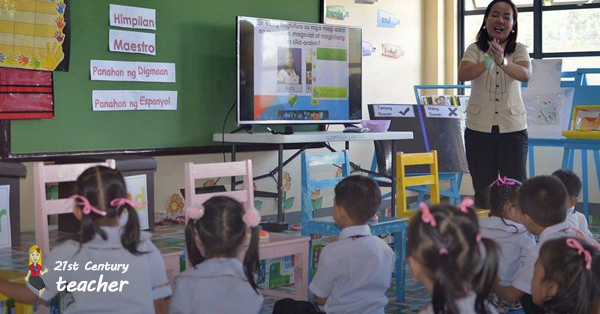 Since most teachers are already adept in using Microsoft products and computer mouse are already available everywhere, this technology now becomes one of the likely candidates for implementation in the classroom. This is the reason why I have always introduced this tech to teachers’ wherever and whenever I get the chance. It is the Mouse Mischief—a solution that lets teachers create interactive presentations making classroom learning more engaging. Mouse Mischief integrates with PowerPoint 2010 and 2007, allowing teachers to create multiple-choice, matching and drawing question slides that students, each with their own computer mouse, can answer on a shared screen. Since most teachers are already adept in using Microsoft products and computer mouse are already available everywhere, this technology now becomes one of the likely candidates for implementation in the classroom. In my Facebook advocacy page '21st Century Teacher', I have placed materials related to this technology. However, let me give you a brief run-down. Once all is done, set it up in your classroom and use it. A common challenge we heard from teachers was that in many classrooms—especially ones without the budget to support technology access for every student—many students don’t have the opportunity to engage directly with technology. Additionally, we learned that many teachers already use and love PowerPoint, but using it by itself as a presentation tool can limit interactivity and collaboration. A solution was needed to turn students from passive observers to active participants. The ubiquity and low cost of mice as a common peripheral make Mouse Mischief a cost-effective solution, especially given tight classroom budgets. And with Mouse Mischief, there’s no need for teachers to learn a new application – the seamless PowerPoint integration lets teachers make their content interactive quickly and painlessly. Students’ engagement in the classroom had gone up significantly, showing enthusiastically in every lesson and discussion makes classroom more meaningful and enjoyable away from traditional way of teaching.